C.E.T. Chew Strips (10 to 25 kg) and chew striplets (up to 5 kg), to help clean your dog's teeth. 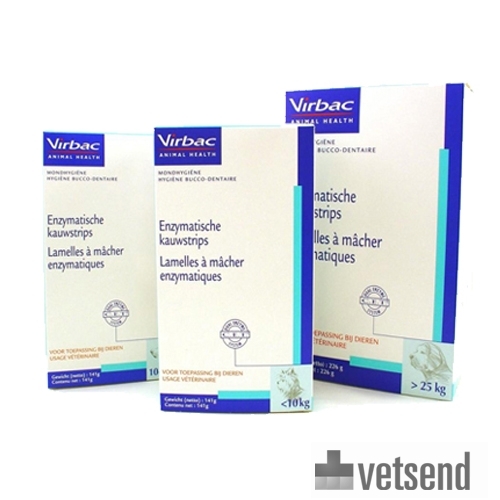 Virbac chew strips for dogs have a mechanical and polishing action. The patented C.E.T. Dual Enzyme System stimulates the bactericidal properties of saliva. The rough texture of the strips cleans the teeth by removing plaque and food debris. The chew strips for dogs are chicken flavoured. Alongside brushing, the chew strips are part of your dog's daily dental care plan. Therefore use at least one C.E.T. chew on days when your dog's teeth are not brushed. C.E.T. Dual Enzyme System (glucose oxidase and lactoperoxidase), potassium thiocyanate, rawhide, sea salt, chicken flavour, dextrose, vegetable proteins and brewer's yeast. Once formed, tartar will not be removed by the chew strip or by brushing teeth. Make sure you start brushing and using chew strips straight away to ensure that your dog's teeth are clean. Have you used C.E.T. Chew Strips before? Let us know what you think about this product. My Yorkie/Maltese boy loves these dental strips. He goes crazy as soon as I open the bag. They are a little hard like a cardboard, but he still chews through them pretty quickly.